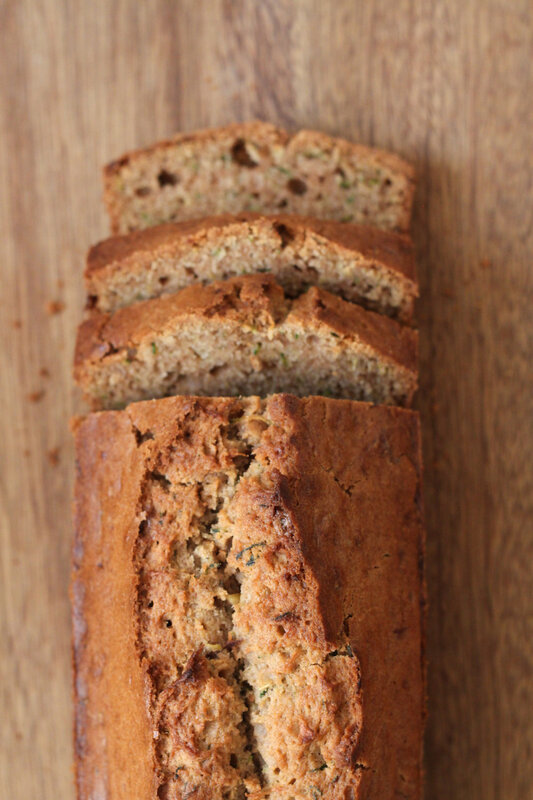 When Life Hands you Zucchini, Make: Zucchini Bread – Eat Me. Drink Me. 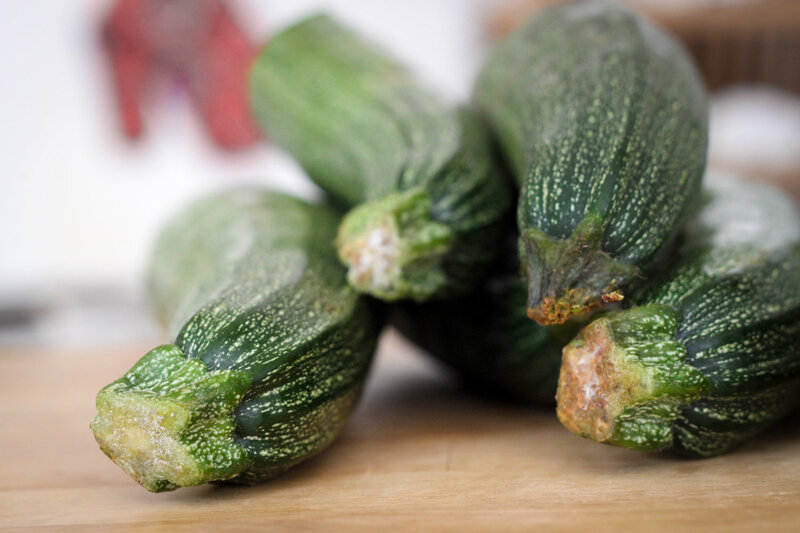 A few days before, Ben had shown up at the apartment with an armload of of zucchini from his market buy the week before. “I can’t eat anymore zucchini,” he said, and thudded them down on the counter, where they rolled chunkily before settling into place. 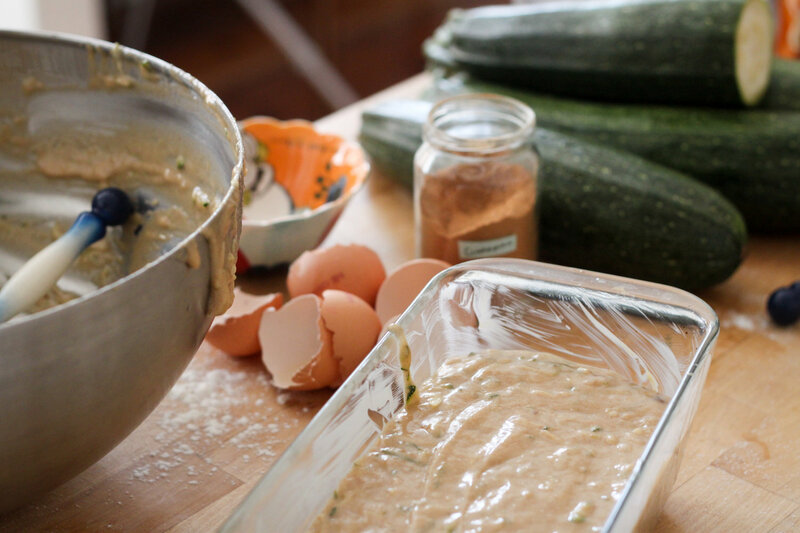 I wasn’t expecting a pile of zucchini, but when a pile of zucchini “falls” into your lap, there’s nothing to do but make zucchini bread. 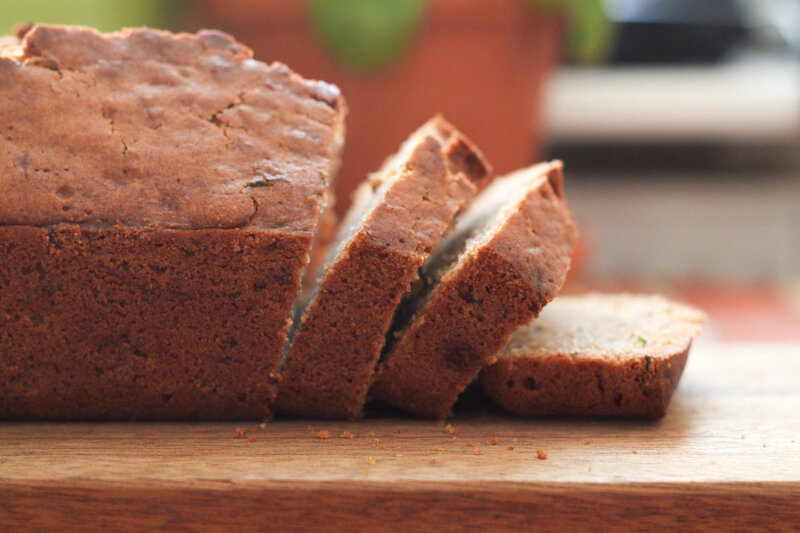 Though it uses up less zucchini than you might hope for when you find yourself with an armload of plump zucchini on your hands, zucchini bread is the perfect way to ease into the season. 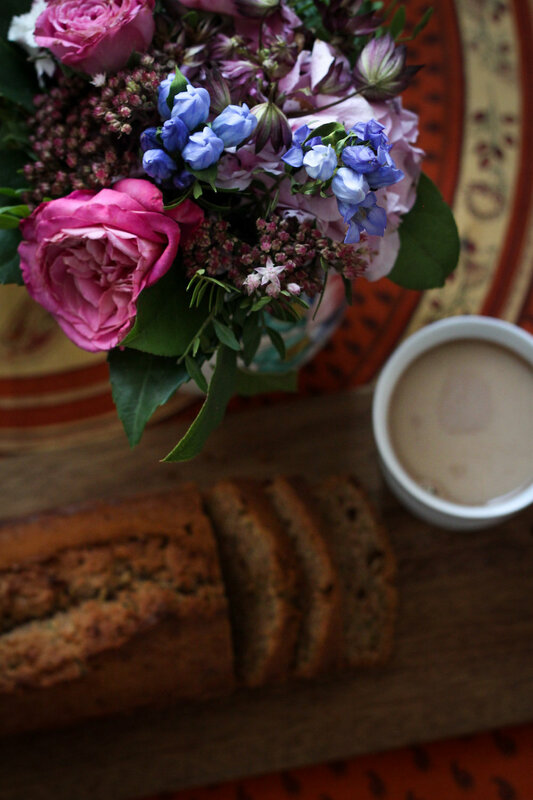 The dusky smell of cinnamon and nutmeg perfumes the kitchen, swirling pleasantly with the crisp outside air snaking in from the cracked-open window. The sun streams in, balming the floury wooden work surface and making the sugar crystals slightly sticky. And there’s nothing more fall-like than a caramel-colored loaf sending up steam. 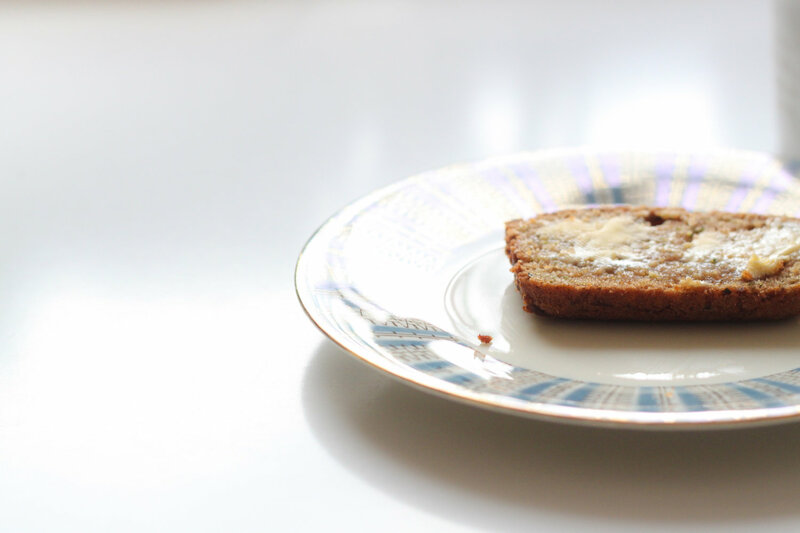 Zucchini bread might taste better and better as it ages, but that didn’t stop me from cutting off a slice straight from the oven, buttering it, and eating it hot with a cup of coffee in the afternoon. It took me right back to my Pennsylvania childhood, a place where falls really were magical – the countryside blanketed in multicolored leaves, and cherry-cheeked apples ready to ripen and drop into the cool grass. 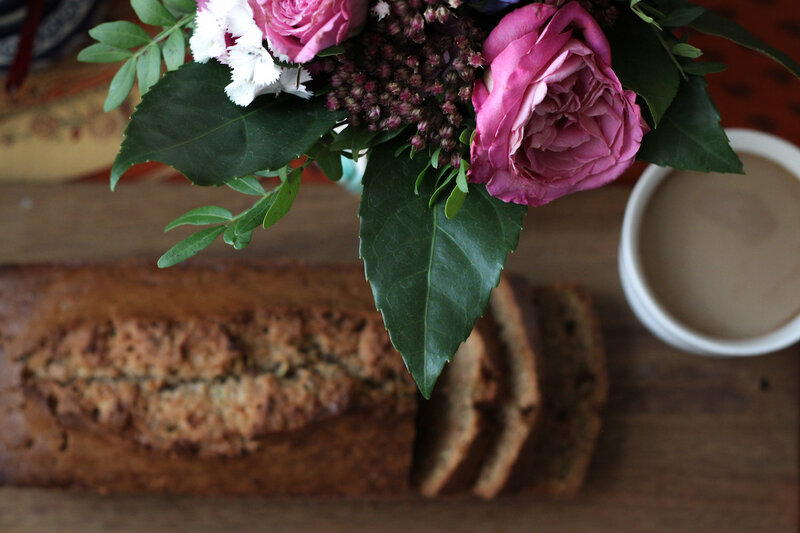 My mom always made zucchini bread with zucchini from our garden, and I remember the anticipation of seeing that loaf resting on the rack – promising a moist, sweet treat after a hard day of learning my times tables. My mind runs a string of associations – from zucchini bread to the long hay grass rustling in the backyard to the sweetish stench of the neighboring cows to the apple harvest festival and sugar-dusted fritters to pumpkins carved into glowing Jack-o’-lanterns and an apple pie crumbled with brown sugar sitting out on the counter. For me, more than any other season, fall is a memory. Maybe that’s why there was nothing to do, but “fall” in love with it. Was that a cheap shot? Maybe. But as September rolls into October, I’m feeling more like myself than I have these last lethargic summer months. I’m not up to snuff just yet, but I can feel my mind starting to twitch with recipe ideas. I’m thinking sweet potato gnocchi and lamb stew with plums and tarragon, ginger-pumpkin butter and maybe even lemon cupcakes with violet buttercream icing. And once I feeling inspired to cook again, I know my fully-functioning brain is never far behind. Dare I say things… “fall” into place? 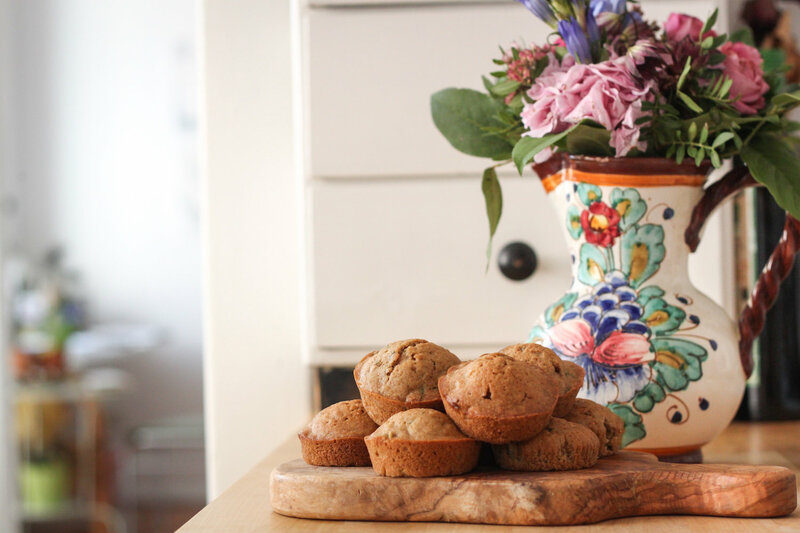 If you don’t want to make zucchini bread, you can make zucchini muffins instead, though I’ve always found that muffins never end up being as moist as bread and don’t have quite that just-home-from-school-treat feeling that a warm loaf on the counter does. 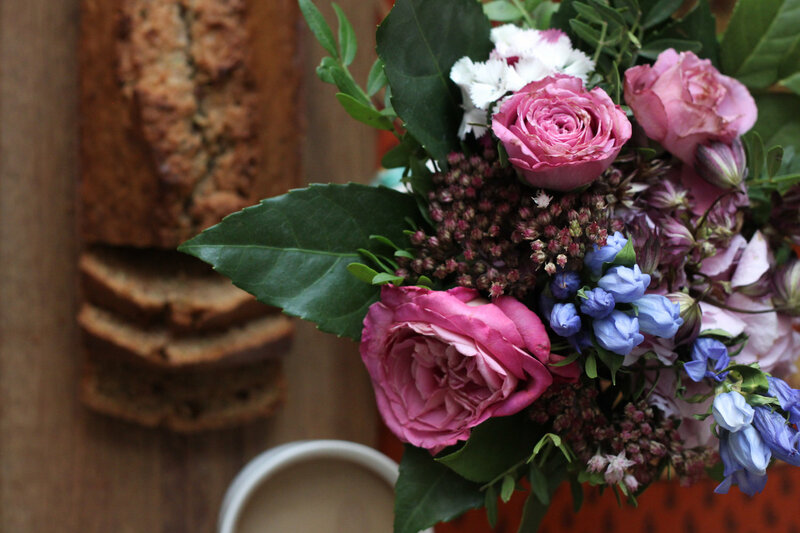 If you do, despite my insistence that it is not better, want to make muffins (because as you can see from the photos, I also made a batch of muffins because I have just one loaf pan), this recipe will make 24 of them. The loaf will keep up to five days stored at room temperature in aluminum foil. Adapted from Smitten Kitchen’s lovely recipe. In a large bowl, whisk eggs, vegetable oil, and sugar together. 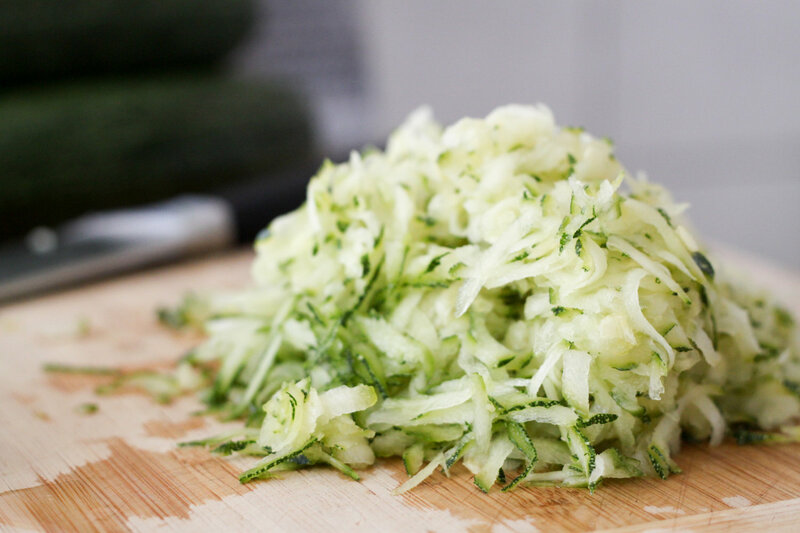 Add grated zucchini and vanilla. 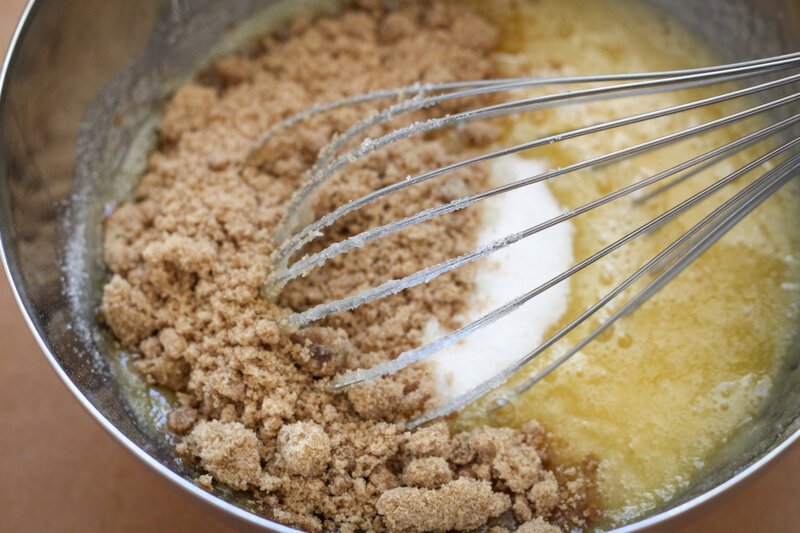 In a smaller bowl, blend the dry ingredients: flour, cinnamon, salt, baking soda, baking powder, and nutmeg. Slowly add the dry ingredients to the wet ingredients, mixing as you go. Using butter or nonstick cooking spray, grease the insides of two loaf pans. Divide the mixture evenly between the two. Bake for 55-65 minutes, or until a toothpick inserted in the center of the loaf comes out clean. Cool on a rack for 10 minutes before inverting from the pan. Those stunning photographs! 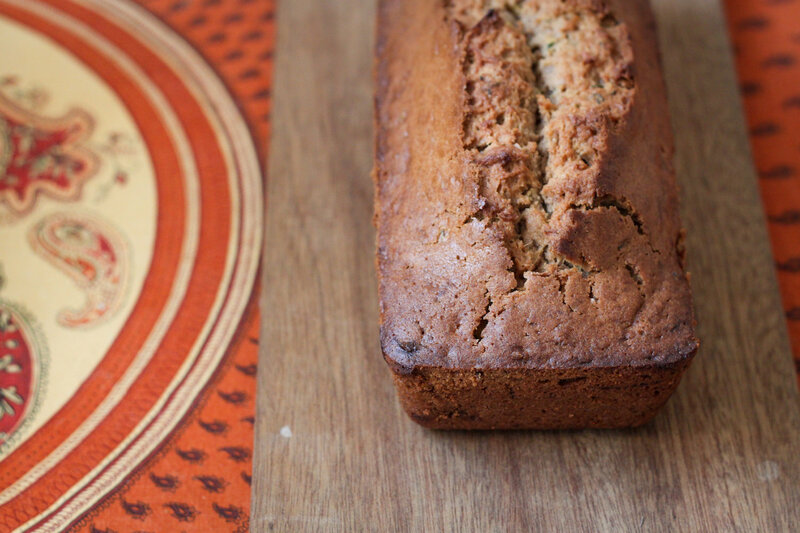 Say what you will, your artist’s eye really autumns the humble fall zucchini bread.